Public policy should serve the interests of all children. However, there are 2 million children being raised by LGBT parents--children from all walks of life, living in almost every U.S. county--who have become collateral damage of ideology and laws designed to hurt LGBT people. All Children Matter is the most comprehensive look to date at these children; how they are failed by society, government and the law; and how simple changes to unfair laws can begin to ensure we are giving all children the chance to reach their full potential. This Condensed Version offers key findings and recommendations from All Children Matter: How Legal and Social Inequalities Hurt LGBT Families in a 34-page "digest" format. Also available: the Full Report and an Executive Summary. Movement Advancement Project, Family Equality Council, and Center for American Progress. October 2011. All Children Matter: How Legal and Social Inequalities Hurt LGBT Families. 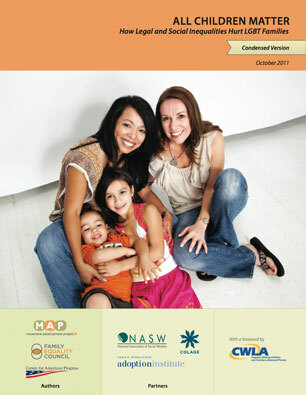 http://www.lgbtmap.org/all-children-matter-full-report (date of access). All Children Matter: How Legal and Social Inequalities Hurt LGBT Families brings together a coalition of LGBT leaders, policy experts and child advocates that includes the Movement Advancement Project, the Family Equality Council, the Center for American Progress, the National Association of Social Workers, the Evan B. Donaldson Adoption Institute, and COLAGE —with a foreword by the Child Welfare League of America. Deny LGBT families child tax credits, costing struggling LGBT families thousands of dollars of income. LGBT families are already part of the American fabric. Public policy discussions often assume the nation is largely made up of married heterosexual couples raising their biological children. But fewer than a quarter of all US households fall into this category. Two million children are being raised by LGBT families. Children of gay and lesbian couples live in 96% of U.S. counties. Surprisingly, the state with the highest percentage of LGBT couples raising children is Mississippi. And overall, LGBT couples living in the South are more likely to be raising children than gay couples in other regions of the country. LGBT families are more racially and ethnically diverse than the general population. Children being raised by same gay and lesbian are twice as likely to live in poverty as children in married, heterosexual households. Decades of research shows that children of gay parents grow up to as happy, healthy and well-adjusted as their peers. All major authorities on children’s health and welfare, including the American Academy of Pediatrics and the American Psychological Association, have supported parenting rights for gay couples. Simple, common-sense changes to laws could begin to protect all children and help them reach their full potential. All Children Matter concludes with 100 such recommendations across several key areas including: legal recognition of LGBT families; equal access to safety net programs; equal taxation; equal access to health care and insurance; inclusion in medical decision-making, FMLA and other laws that allow families to take care of each other; anti-discrimination laws; and research and education.